A close relative to endive found in the US, chicory is a salad leaf best eaten raw in salads. It has a slightly bitter taste and can be baked or pan-fried. Certain varieties are roasted then ground for use either as a coffee substitute or mixed with coffee to give it body. 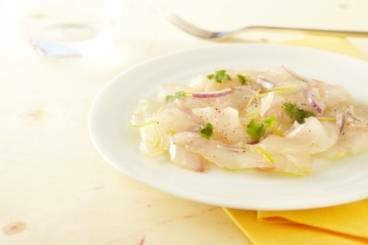 A delicious bream carpaccio seasoned with citrus, coriander and chicory. Pan-fried lamb steak served with creamy polenta, caramelised endive and cherry tomatoes roasted in balsamic vinegar. Grilled chicken breast served with Marsala wine sauce and braised chicory. A tender grilled pork chop served with glazed chicory and a home made sauce a la moutarde. Roasted guinea fowl breast with balsamic glazed chicory, walnuts and bacon. 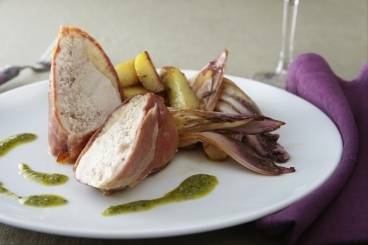 A succulent guinea fowl breast wrapped in pancetta and served with caramelised red chicory leaves and rosemary roasted new potatoes. Pan fried foie gras with a pear and chicory salad and an orange and cinnamon dressing. A simple sponge cake flavoured with chicory and chopped walnuts topped with coffee flavoured icing.